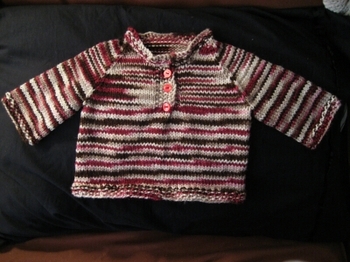 Another finished baby sweater (wow this one went fast) I followed the same pattern as the one in the below post, but changed it a bit. I knitted in the round until it came to divide for the front and back, and knitted the sleeves in the round for the 4.5 inch (newborn) then knitted back and forth. I think that made it go so much more quicker. In the future, I think I'm going to make another one with the button band all the way down the front. I'll knit the sleeves in the round though for the length needed. 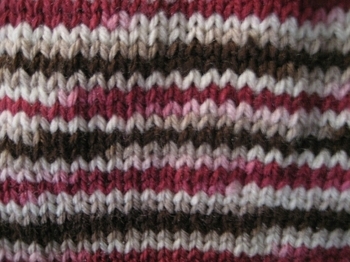 I also did a wider bit of seed stitch on the edges and button band. I think it helped with rolling. I didn't have enough yarn for a hoodie though, so this one goes with out. I got the yarn at Joanns and it's baby friendly, wash it and toss it acrylic. I am still looking for a pattern where I can find some nice soft (maybe shine from knitpicks) cotton yarn for a summer sweater. But I'm on a roll with this pattern. I believe I'm going to gift this to a New grandma at church for her granddaughter. She's one of the few 'real life' people who have shown interested in my knitting and have asked if I would knit something for her before. 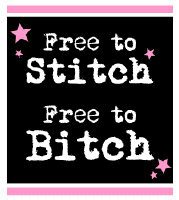 Yesterday I shared fabric I'm hoping to use for a Moby Wrap. 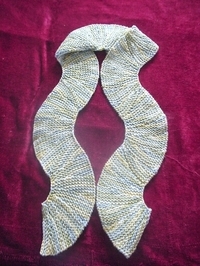 Nicole, one of my 3 faithful readers (grin) asked if I thought a Wrap could be knitted. While I guess it's possible, and I had thought about it after not finding good fabric on my first few trips (read: fabric on sale) I'm not sure it's doable. I'm not 100% sure the fabric I bought will really be doable in the summer weather. I looked for a cotton knit blend, but all they had was polyester. (unless I wanted to buy the $5 to $6 dollar a yard fabric which would have been silly when I can get a true moby for $30 to $40.00) I couldn't pass up this fabric though, since it was only 1.76 a yard and in pretty colors I like. So I'll try it. 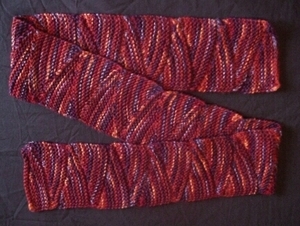 I need to finish sizing it soon, as it was much wider than 24 inches. I may or may not seam it. If it doesn't work, maybe I'll be able to make a little dress or skirt for the 4 year old. What a cute sweater! I love the colours. I've been using Lily cotton to do my baby knitting for friends but mostly that's for baby bibs. Red Heart soft is a great machine washable acrylic but probably too warm for summer. Mei Tais are nice for the summer though if you need more support.